Having shared new single "All Out Life" last October, Slipknot have now set a release date for their first new album in five years alongside news of a North American tour. The band will deliver their yet-to-be-titled sixth album on August 9, which will fall in the midst of their 29-date "Knotfest Roadshow" trek. Slipknot note that each pair of tickets purchased for the tour comes with a digital copy of the LP upon its release. Set to begin July 26, the tour will see Slipknot accompanied by Volbeat, Gojira and Behemoth. A lone Canadian stop will bring the four-band bill to Toronto's Budweiser Stage on August 8. You can find a full itinerary below. 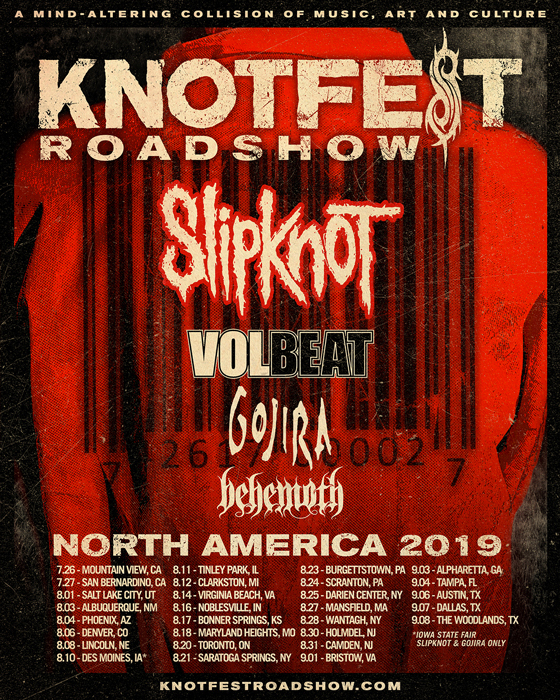 Tickets go on sale to the general public Friday (March 8) at 10 a.m. local time, while members of Slipknot fan club Outside the 9 have a shot at a ticket pre-sale beginning tomorrow at 10 a.m. local time. Further ticketing details can be found here.